This skin is part of the Rusty Rooster suite. There is a bunch of other Rusty Rooster stuff (IconPackager, Wallpaper, Sysmetrix, Rainlendar, etc...), take a look in the appropriated sections. I'm downloading the whole suite and I love it! Fantastic job! Thank you so much for sharing! Yup, I died and went to heaven. 2 skins from pixtudio in 1 week. Really nice skin. The zooming icons are a sweet touch. Thanks for sharing your creative talents. Great colors. Only one issue. A portion of the word Turn off ""Comput"" on the Start Menu is cut off. How can I adjust this? This is beauty at its best. The suite completes me. This suite is awesome. One problem, sysmetrix doesn't work, says backround missing. Nevermind I got it to work. 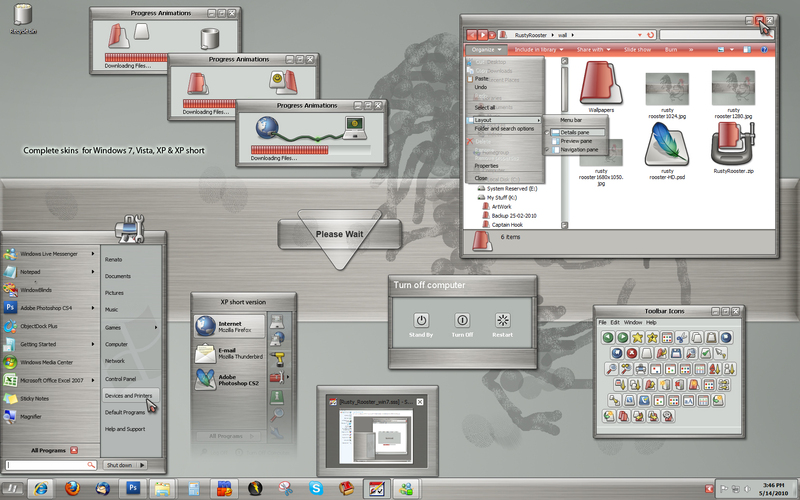 This is too much.Pixtudio and Windowblinds 5 in the same day.The brushed look is totally awesome. Great, great suite---two really big ! Ultra awesome by any measure!! Treetog's at it again! 5 STARS it is! Better hope no one needs your fingerprints for anything,otherwise we have them,if they are yours.lol.